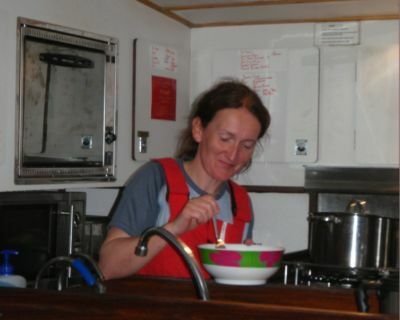 (Above) Linda in the galley enjoying the fruits of her labour and then having to labour with the washing up. Greetings from the Red team, formerly known as White. Yep, you read that correctly – we have changed colours. A minor communication error between the Red and White watch at the beginning of the trip meant that White came on shift too early in place of Red (we’re currently blaming this on excitement and eagerness). To avoid complications in trying to swap the shift back through timings, we simply agreed to swap our colours. You’ve no doubt guessed from the title of the blog that as a result of the change we’re now on motherwatch (as of 1200). 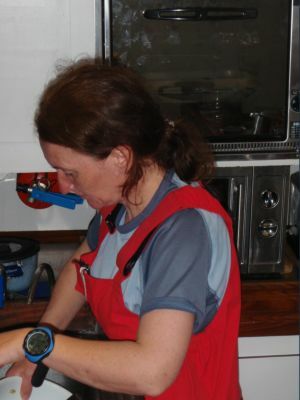 The mal de mer has conquered many of the crew – I believe twelve of the fourteen on board have suffered to varying degrees (only the skipper and mate have been spared). This has had a rather negative effect on Café Rouge even though the meal prepared (by Andy and Linda) was excellent. Greg and I were fortunate enough to have some time in our pits – the sleep has certainly done me a world of good (I feel human again). This blog was due to be written by one of the White watch (formerly known as Red) but they have all gone straight to bed without dinner so the duty has fallen to me again. We appear to be making reasonable progress. I understand that as I write this entry, we are about 30 miles from Bishop’s Rock. It is now time for me (I sent Greg to his pit as he wasn’t well) to look after the on watch (the Blue watch lead by Rachel) and to get the rest of the duties completed (like wiping down all the surfaces and cleaning the heads) before I can head off to my pit for a few more hours snooze and then it will be time to prepare breakfast. Hopefully we will have better custom at Café Rouge in the morning.